Colosseum is regarded as the most popular monument of the ancient world. It has watched the city of Rome for almost two thousand years. Its briks and slabs of travertine are the symbol of the city and the Roman civilization. Flavian Amphitheater has history and extraordinary dimentions. Construction works started under Vespasian and were completed by his son Titus, between AD 72 and 80. It was built in a valley between the Palatine, Oppian and Caelian Hills crossed by a stream running towards river Tiber. Emperor Domitian made further modifications. These three emperors are known as Flavian dinasty, so the Latin name of the amphitheater is related to their family name. However, the name "Coliseum" was born in the Middle Ages due to a famous bronze statue of Nero standing nearby, the Colossus of Nero so called for its colossal dimentions. It's the largest amphitheater of the ancient world. It's an oval of 525 meters in circumference, while the arena is 86 meters by 54. In the beginning it was 52 meters high. It could host up to 50.000 viewers and was used for animal hunts, gladiatorial contests, dramas on Classical mythology. It was damaged by an earthquake in AD 440 and was abandoned in the VI century. Later it was used as a keep for a short time and right after that it's the part when all decorative coverings were stolen. 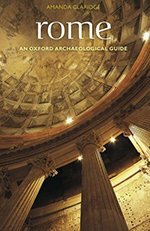 In the 17th century Curch begins regarding Colosseum as an holy place where Christians were martyred even if there's no historic evidence of it. In the 19th century important works of restoration started up and in the 30s of the past century dungeons were brought to light. In the park there's not only the Flavian Amphitheatre but also further epic monuments of the ancient Rome like the arch of Constantine, Domus Aurea, Roman Forum, Palatine Hill and Meta Sudans. Download the map of archaeological park of Colosseum. Next to the Colosseum there's also the arch of Constantine. It was built in 315 to celebrate emperor's victory over Maxentius. It's made of slabs of marble taken from earlier buildings. Decorative statues and riliefs celebrate not only Constantine's quests but also Marcus Aurelius' and Adrian's victories. Forum valley lies between the seven hills of Rome. It was a swamp at first.Roman Forum was made at the end of the VII century BC after clean-up works. 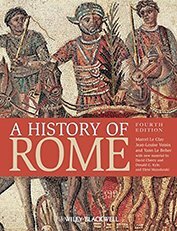 It has been Roman public life's core for more than a thousand years. Over the centuries it was fitted with further monuments: buildings aimed to political works as well as to religious and business activities. In the II century they built up basilicas for judicial business. At the end of Classical Rome age the old Forum wasn't enough no more to manage the city at its best. After the fire in AD 64, which destroyed a large part of the city center, emperor Nero started building a new mansion. It was called over ages "Domus Aurea" due to its luxury and majesty. 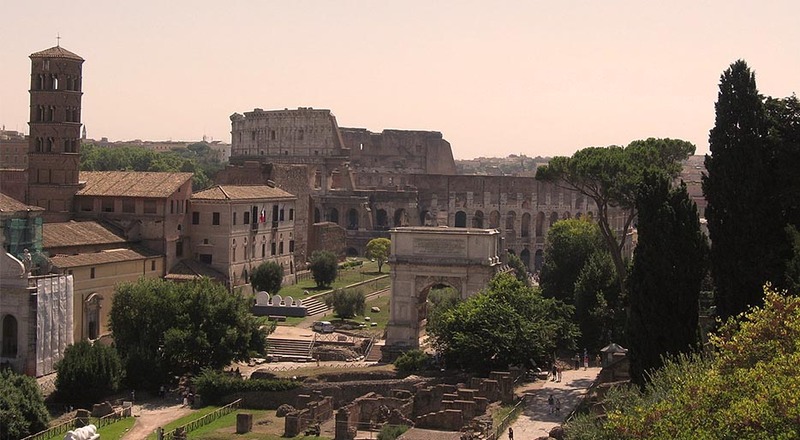 It was made up of a set of buildings connected by gardens, woods and even an artificial lake right where the Colosseum is. Main bodies were on Palatine and Oppian Hills. After Nero's death successors erased all traces of his power tearing up decorative coverings and statues from palace halls and then filled them up with earth. Buildings on Oppian Hill are still open for visitors. It's believed that they were aimed to feasts and parties and then, after Nero's death, buried under Trajan's Thermal Baths until rediscovery in the Reinessance. On Palatine Hill are still preserved the remains of a settlement dating from Iron Age, the oldest one of the ancient city of Rome. Important worships as Magna Mater's (Cybele) were taken here. Then between II and I centuries BC the hill became the main site of Roman aristocracy residential district. It hosted fancy mansions plenty of beautiful paintings and decorated floors as the very well preserved ones in Gifi house. It was a monumental fountain named Meta Sudans after its conical shape, according to sources dating from the VI century AD. It worked until the fifth century AD when the outflow canals started to became blocked. Ruins were taken down in 1933 because of the construction of Via dei Trionfi and now the basis is all that's left. We can just figured out the way it looked through images on depicted coins and drawings taken during works for demolition. The base was a cylinder covered by marble, maybe fitted with niches. Then it had an upper element of conical shape with a decorative item on top, maybe a sphere or a flower. Last entrance: 1 hour before closing time. Colosseum is closed on 25 Dec and 1 Jan.
Tickets can be purchased online as well. Colosseum is in the core of the historic city of Rome. 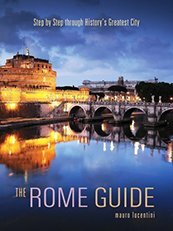 One can get it by walking through the amazing Via dei Fori Imperiali between Piazza Venezia and the amphitheatre so that one can see both Colosseum and Fori Imperiali in a single itinerary.